Praised by The New York Times for its “dramatic, energetic playing of clean intensity”, the Tetzlaff Quartett is one of today’s leading string quartets. Alongside their successful individual careers, Christian and Tanja Tetzlaff, Hanna Weinmeister and Elisabeth Kufferath have met since 1994 to perform several times each season in concerts that regularly receive great critical acclaim. 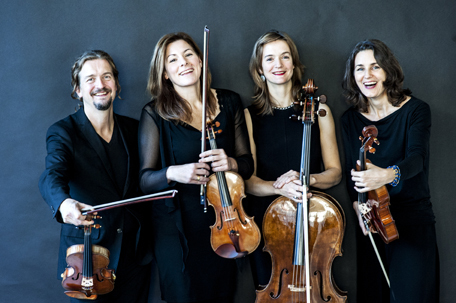 The current concert season sees the quartet perform in Berlin, Hamburg, Munich, Leipzig, Aachen, Lörrach, Amsterdam, Bern, Gent and Wimbledon as well as at the Festival Heidelberger Frühling. They are frequent guests at international festivals such as the Berliner Festwochen, Schleswig-Holstein Music Festival and Bremen Musikfest. Other recent highlights include performances at Kölner Philharmonie, Konzerthaus Berlin and Paris’ Auditorium du Louvre, as well as a North America tour with concerts at Carnegie Hall, in San Francisco and Vancouver. The quartet has also performed at Brussels’ BOZAR, Wiener Musikverein, Herkulessaal München, Amsterdam’s Concertgebouw and London’s Queen Elizabeth Hall. The quartet’s first recording, unusually pairing Schoenberg’s String Quartet No.1 with Sibelius’ Voces intimae, was released in 2010, while a recording of Berg’s Lyric Suite and Mendelssohn’s String Quartet No.2 was released in November 2014 and was an Editor’s Choice of Gramophone Magazine.